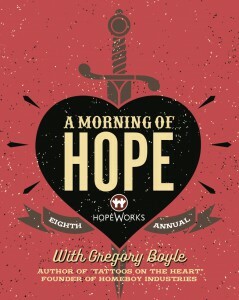 Join us for A Morning of Hope Breakfast 2016 with speaker Gregory Boyle, author of Tattoos on the Heart on Saturday, June 11, 2016 at Woodland Hills Event Center. Gregory Boyle has dedicated his life to the plight of men and women struggling for an identity amid civil unrest in Los Angeles, California. In 1992, with local help and years of preparation and planning, Boyle debuted Homeboy Industries. The organization offers formerly gang-involved and previously incarcerated individuals the tools and resources necessary to live a life away from crime and gang violence and become productive and self-sustaining members of society. For more than 25 years, Gregory Boyle has steered thousands of people away from gangs and toward a better life with the help of counselors, countless volunteers and an ability to connect to those in his community. Homeboy Industries is a national model that is recognized as the largest and most successful gang intervention and re-entry program in the world. Click here to purchase tickets through Eventbrite or to purchase tickets by check, call 272-3700 x104.